Yesterday I made a visit to Costco, and was it ever slammed! I guess a lot of people lost a lot of their perishables to the power outage, and had to stock up. Not only that, but with the power out for so much of the weekend and a request for people to stay off of the roads Monday, most people weren’t able to do their weekend grocery shopping. While I was at Costco, I picked up a rotisserie chicken, which at $7.99 for a fully cooked bird is the best price around, so far as I know. I honestly am not certain whether buying poultry cooked at a grocery store is more energy-efficient than cooking it at home, but I have an inkling that it is. If not, well, at least I wasn’t cooking it near dinner time, which tends to be a peak time for energy usage because so many of us have electric stoves and microwaves. At any rate, I decided to do another cold dinner, so I stripped the chicken carcass and chopped up all of the meat into bite-sized pieces. Then I mixed them with some chopped green onions and mayonnaise. I served the chicken salad with baby spinach on toasted ciabatta bread (also from Costco). As sides, I peeled oranges and sliced strawberries. The weather yesterday was rainy and dull, so while cooking outdoors could have been done if necessary, I wasn’t really looking forward to it. Sadly, tomorrow’s weather isn’t predicted to be any nicer; actually, we’re supposed to get thunder and lightning again. Yay? 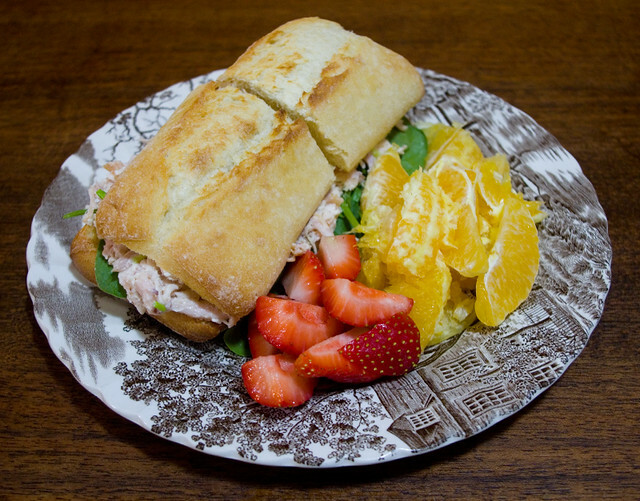 Posted on September 26, 2018 September 25, 2018 by owntwohandsblogPosted in Cooking, HomeTagged bread, chicken, ciabatta, cold, costco, dinner, easy, food, orange, rotisserie, sandwich, simple, spinach, strawberries, supper.